Northeast Minneapolis is a district in Minneapolis. Once a working-class, largely Eastern European neighborhood, the "Nordeast" has recently seen an influx of young professionals and artists. This demographic swing, combined with neighborhood revitalization efforts, have resulted in a resurgence of both commercial space and a thriving artistic community. Northeast Minneapolis, with its plethora of "neighborhood" bars and eating establishments, is becoming a nightlife hotspot for those wishing to avoid the cost and clientele of Downtown and Uptown drinking. While Northeast is larger than you might think, a kind of 'downtown' Northeast has formed in the Old St. Anthony area (which technically occupies about equal areas of both Northeast and Southeast) and continues to develop around the triangle of Hennepin Ave, University Ave, and Central Ave. This area houses a thriving commercial district with new and developing urban residential buildings. 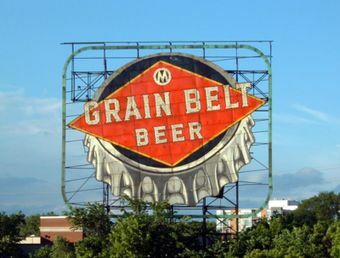 Along the river on the Northeast side is St. Anthony Main, signed in neon as such and visible from the Hennepin Ave bridge. St. Anthony Main houses several good restaurants, bars, a movie theater, and businesses. It can be quite lively on warm summer nights, and often deserted during winter. The city has designated the area bounded by Lowry Avenue, Central Avenue and Broadway as the Northeast Minneapolis Arts District. It includes most of the major studio buildings which are open during Art-a-Whirl every May: The Northrup-King Building near Central Avenue and 14th Avenue NE, the California Building south of Lowry at 23rd and California, the Thorp Building just north of the railroad tracks 1t 1620 Central Avenue, and the Grain Belt complex on the Mississippi River at Marshall Street and Broadway. There is also a small, arts-heavy commercial district on 13th Avenue NE between 2nd Street NE and 4th Street NE, including several prominent galleries, the Ritz Theater (reopened in 2006 as the home of Ballet of the Dolls), and bars and restaurants including the Modern Cafe and Erté. From Old St Anthony, keep heading up Central Avenue. At first you will pass through a bleak industrial area, but afterwards you will find a thriving commercial strip along Central stretching from 18th Avenue onwards. A hub of Indian groceries and stores is around 19th Avenue, and another hub of Middle Eastern and Latin American restaurants and stores has emerged around Lowry Avenue and Central Avenue. Once you pass 27th Avenue, the activity drops off and the street turns mostly residential on the east side and with the Shoreham rail yards and Columbia Park (largely occupied by a golf course) on the west side. Commerce picks up again just north of the city limits of Columbia Heights at 37th Avenue. From downtown Minneapolis, head north east across the Hennepin Ave bridge or the 3rd Ave bridge. The triangle formed by Hennepin Ave, Central Ave, and University Ave places you squarely in 'downtown' Northeast. Northeast can be accessed from the freeway system via I-35W. Similarly to North Minneapolis, numbered avenues run east-west. Due to the geometry of the river, these numbers are lower than the numbers of the North Minneapolis avenues opposite them. This only comes into play when you are crossing one of the bridges. Plymouth Ave is equivalent to N 13th Ave, but becomes NE 8th Ave. Lowry Ave is equivalent to N 32nd Ave, but becomes the equivalent of NE 25th Ave east of the river. N 42nd Ave crosses the Camden Bridge to become NE 37th Ave. Except for a few numbered streets near the river and a few "half-blocks", the north-south running roads are called streets and are named after U.S. presidents in chronological order heading east. The above rules break down in the area closest to downtown. The street grid turns from the strict compass-points grid to line up with the river, and a grid with both numbered streets (parallel to University Ave) and avenues (parallel to Hennepin Ave) holds sway. In the transition zone between the two grids, a brief mini-grid uses the names of the seasons. 13th Avenue galleries, including Frank Stone Gallery at 2nd St and 13th Ave, 212 Pottery half a block east of 2nd St, and Rogue Buddha Gallery, half a block east of University Ave on 13th Ave.
Other notable Arts District shopping includes the PPL Shop, Dunlaoghaire, Icebox Gallery, and Mobius Antiques in the Northup King Building at 1500 Jackson St; Creative Electric Gallery at 2nd St and 22nd Ave, and Clay Squared to Infinity in the Keg House Building of the Grain Belt complex, on 13th Ave at the Mississippi River (just north of Broadway). For coffee shops with internet access, see coffee listings.